Louise is a twenty-six year old, single mother with a six year old daughter called Jenny. Jenny’s dad ran off as soon as Louise told him she was pregnant. Now she is stuck working nightshifts as a checkout girl at her local supermarket. Today is the day Louise is going to do something about her life. What You Wish For is a structured freeform roleplaying game for exactly 3 players. In it you explore the happiest memories and greatest hopes of everyday people, just like you and I, who have become stuck in a rut, dissatisfied with their lives and directionless. You will reflect upon your characters past, dream about their possible future and then make a positive move forward to change their lives for the better. Games of WYWF are pacey, taking around 1 – 2 hours to complete, but they produce satisfying and emotionally poignant stories. 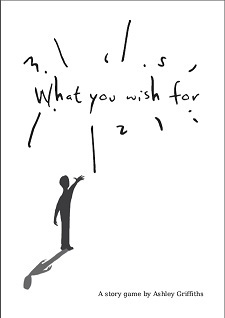 What You Wish For is available on a pay what you want basis (yes, that includes nothing) from RPGNow.